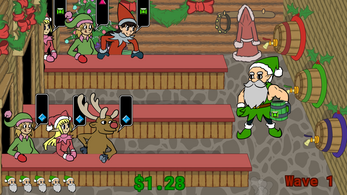 It's December 26th, and the elves are ready to party after a busy Christmas Day! 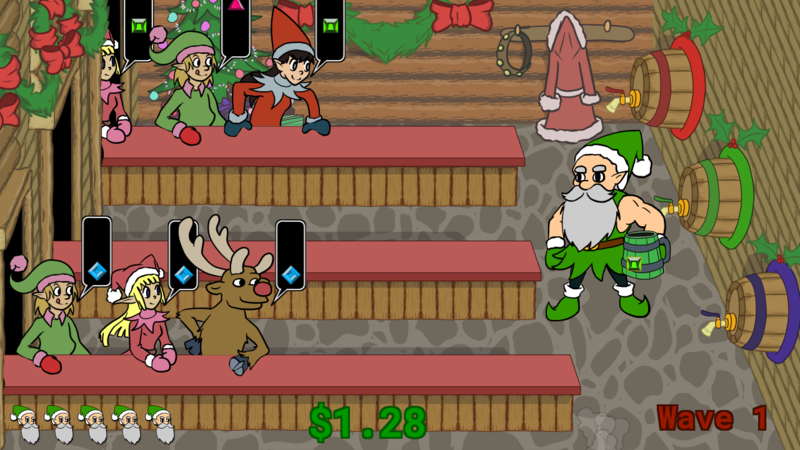 Help Brugga shove spirits down the elves throats and collect tips. - Press 'Pour' at a tap to fill a tankard with that tap's drink. - Move between rows to pour multiple drinks into the same tankard. - Press 'Send' to send the filled drink out to a patron. Be sure the drink combination matches their request! - A patron will leave the bar if they are sent out of the bar after grabbing their drink. If they don't leave the bar, they'll send the tankard back and ask for another. - Brugga can mix multiple drinks into one tankard. Press 'Pour' at different taps to fill the tankard up with different mixes! - Brugga can hold a spare tankard in his other hand. Press 'Swap' to move a tankard to the other hand, then press 'Send' to throw it! - If Brugga is holding two drinks at once, press 'Send' twice to send both - first the left drink, then the right drink. Windows: Extract the folder and run Brugga.exe.